Build this Strandbeest kit yourself! It has a very interesting mechanism: blowing into the fan makes the animal start walking against the wind. The wind power is conveyed to the legs by 2 gears. The 28-page science guide gives you the history of the real Strandbeest that Theo Jansen started building in1990. The guide also includes easy-to-follow assembly instructions. 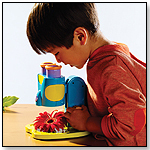 — Matt Peel, manager of Toys & Co. in Greensboro, N.C., told TDmonthly in a January 2015 survey that the GeoSafari line from Educational Insights was their store's best-selling STEM toys.